And he did. I think most of us can recognize our own lives in his art. Munch is universal, because he shows us who we can be – on the large canvas between love and angst. Munch wasn’t merely a genius painter – he was also a bold and innovative printmaker. I am very pleased to see British Museum showing Munch’s graphic works in such a grand manner. 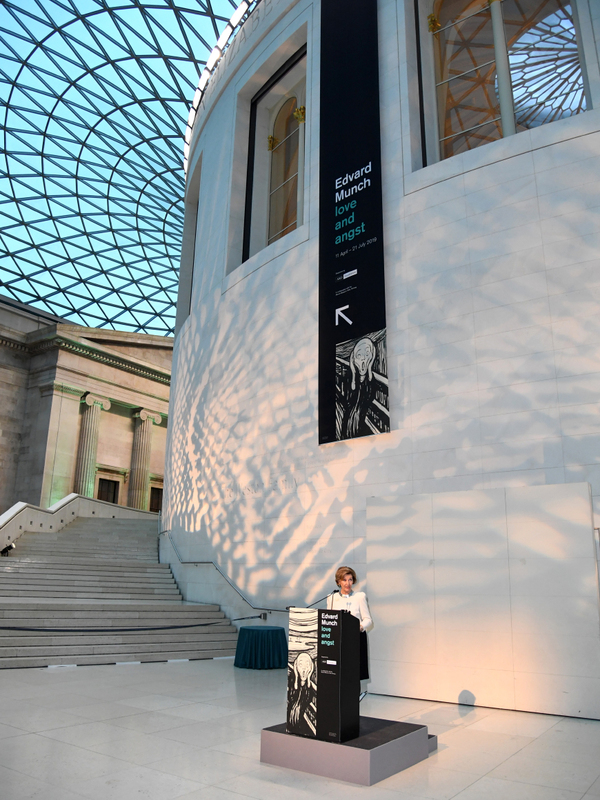 The largest ever loan of Edvard Munch’s prints to an institution would not have been possible without the excellent cooperation between British Museum and the Munch Museum. The cultural relations between our two countries have always been very strong. We are encouraged to see an increased awareness about Norwegian artists and Norwegian art history in the United Kingdom. As this exhibition shows, the world of printmaking may be a room for artistic experimentation and testing – it is, indeed intriguing and many-faceted. I am delighted and proud to declare the exhibition “Munch: Love and Angst” open!